After the whipping, they tied that cursed beam across my shoulders. I was to carry it to the place where they were to put me on to the upright post. They had a special place for this to happen. It was a hill called Golgotha, “The Place of the Skull.” A fitting name. The beam on my back was no small piece of wood. It was very heavy. Also, the whippings that they had put into my flesh immediately began to do their work. Even on their own, the wounds from the whip stung like knife cuts in my flesh, but the wooden beam across my shoulders rubbed each cut that they had made high on my back. The torturers had made sure that the whip had made some deep cuts high on my shoulders, as well as on my back. They knew I would be carrying the wooden beam there, and wanted me to feel every sliver. As I walked along on my way to Golgotha, there were some people spitting on me and cursing me. Oh how I hated those people! If I had the power, I would have killed them all right then and there. However, I noticed that they had not actually come out to torment me and my partner in crime as much as for a man named Jesus. Once in a while, as I walked, I could see him also carrying a beam on his shoulders. How the people seemed to loathe him! They spat upon him and cursed him with an intensity far greater than they did to me. Someone had placed a crown made of thorns on his head, so not only was he bleeding from the beating that he had received, but the thorns had dug into his head and his blood was running down his face and dripping to the ground as he walked, hunched over from the burden of the wooden beam on his shoulders. Despite the fact that he was already in great pain from the wounds and from the chafing of the cross, the people continued to beat him with rods as he walked by them. I even got some kind of a perverse satisfaction from this fact. I had no pity on this other man. I heard the people yell out “crucify him.” I at first I was not absolutely certain who this man was, but then I heard someone mocking him. “Hail, king of the Jews!” they cried, followed by bitter laughter from those around. “It must be that man, Jesus,” I thought to myself. I had heard of this Jesus. I had even been in the crowd during some of his teachings. The crowds that came to see him were so thick, it was easy to pass in between people and take some of their money purses. I had also heard a few of his teachings, but I paid not too much attention to them. He talked about loving other people and about setting our hopes and desires for life after death. I had no interest in these things. I hated other people instead of loving them, and my hopes and desires already had a goal. My hope was for what I can get now and my desires were for right now. The walk to Golgotha was almost more than I could bear. The pain bit into my back at every step, and I could manage each of those steps only by putting all of my strength and mental energy into each movement. Besides this, there was the heavy weight on my shoulders. It drove me to the ground twice, and many times more I would have fallen, had I not feared the whip. I won’t tell you of the process of placing me up on the cross itself. I am not sure that I have the strength to do so. Why I did not black out with the nails being driven through my flesh, I do not know. Again, the Romans were well practiced at this. They knew exactly the placement of the nails between bones in the hands and feet so that, when the entire weight of the body hung on them, the flesh would not tear away. They bent the tops of the nails in my hands once they had driven them through, so that I would not be able to pull my hand off of the nail in order to give me a little relief in my struggle for breath. That is the worst aspect about hanging on the cross, by the way. 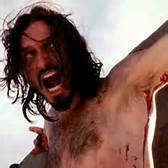 If you think that most difficult thing to bear in a crucifixion is the extreme pain, you are wrong. The very worst thing is the fact that in addition to the searing pain, one cannot even get a good breath. A great deal of your weight is upon the nails driven into your hands. This makes your arms hyper-extended, stretching the muscles around your lungs to the extreme so that you are not able to draw a breath. The only way that I was able to get any air at all was to put more of my weight upon the nails driven into my feet. This allowed me to draw myself up enough so that some of my weight could be taken off my arms, which gave me the ability to draw in a little air. Oh how I hated those people down on the ground jeering at me! If I would have been able to, I would have spat on each one. But I had no reserves to do that. As much as I hated those people on the ground, I also hated this man Jesus. I even joined in hurling insults on him, at least what I could manage in my weakness. My hate for the people and for Jesus was so strong that despite my terrible situation, I made myself manage to voice even disdain for him. Then Jesus said something. His voice was so weak, I could barely hear it above the noise of the crowd, even though he was only a few feet away from me. I fell silent. I looked at the face of Jesus. Under all of the blood running down his face, I looked into his eyes. He looked at me. I saw no hate there in his eyes, no regret. I only saw love. With those words from Jesus, nothing that the Romans or the people did could any longer torment me. The hatred that had so long ruled my life ruled it no longer. For the first time that I could remember, I felt love for another person. I especially loved that bloodied and battered person hanging on the cross next to me. Then Jesus let his head fall forward. He would struggle for breath no more. It was now getting toward evening, and the Sabbath was about to begin. The Jews did not want our bodies hanging on the cross on the Sabbath, so they asked Pilate to have the soldiers break our legs. With our legs broken, we could no longer lift ourselves up by our legs to help us take in some air. Actually, I was glad that the time had come. I was glad to be able to leave that cursed life to begin my new life in the kingdom of Jesus, with him as my Lord. The soldier began over at the cross of my former partner in crime. When they struck his legs with a heavy mallet, he did not even cry in pain. At this point, we were almost beyond feeling pain. When they came to Jesus on the middle cross, one of the soldiers declared him already dead. Because of this, they did not bother to break his legs. Nevertheless, I suppose out of spite, one of the soldiers trust a spear into his side. Of course, Jesus made no sound when this happened, but blood and water came out of the wound. Considering all of the bleeding that Jesus had done, I remember being surprised that there was any blood at all left in him. It was one of the last rational thoughts that I had. The soldiers next came to my cross. When the mallet hit my legs, first one and then the other, I remember hearing the bones break and even felt some pain, but I was glad at this point to hasten my death. I was ready to leave that life that I had wasted. With my legs now broken, I could no longer breathe. I think that, under most circumstances, this must be a terrifying experience. However, for me, I was glad not to breathe the air of that condemned earth any longer. I may have been condemned to death, but when I saw the eyes of Jesus and heard him speak of his kingdom, I knew that this whole world is condemned without him. Only those who place their trust in him will truly be pardoned, and will live. That earthly air had become contaminated and foul to me. With joyful anticipation, I looked forward to soon breathing heavenly air. As I felt my death coming, it was not with fear. Instead, it came with the all comforting words of Jesus still sounding in my ears.